February. A new song. No…Two new songs. The Church of Jesus Christ is slated of April, but I will use it in February in order to have a contrast with the mood and tempo of He Sent His Son. Notice the contrasts between not only the mood and beat of the songs, but the activities used to teach them. The flow of energy between each of the activities is different, which makes a wonderful flow to the entire Singing Time. Notice the variety of activities used to teach the same song. Remember the brain craves variety, but desperately needs repetition with time in between each repetition. Notice that each song has a movement activity for the kinesthetic learners. Remember that each child’s brain is built to learn feelings and attitudes, thought processes, and brain connection by moving. Primary Music with variety, yet repetition, contrasting flow, and kinesthetic learning that reflects the mood and tempo of the song really is a great thing for brains! Our primary is combined. Do you show things for that? Dear Cathy, When you have combined Primaries, you have to simplify things for the younger children and complicate them for the older children. Perhaps a teacher could lead the younger in this activity, and you could lead the older children. Often I ask for the buddy system with an older child helping a younger child. This would be too complicated an activity for that, but there are other activities where the older child could bring up the level of what a younger child could do. I’m writing myself a note right now to write some ideas dealing with combined groups. Thanks for asking! I have used some of your teaching ideas and they have always been just right for my primary. I love your blog and feel so thankful for the time you use to share. Thank you! 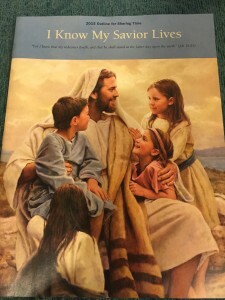 I feel like my primary children have been really connecting with the music and the messages as I testify and as they feel the music in different ways. Thanks again for sharing your talents and telling us the “why” behind your ideas! We have about 50 children that attend our junior primary, and another 50 in senior. With chairs in the room we are packed in there. I’m wondering how to make the activities that require them to be sitting in a circle work for us. Do you put the chairs up and have both singing time and sharing time on the floor? Would having some kind of laminated shapes on the floor work for there home base, or do you think with that many children they wouldn’t be able to handle it? I want to try the mauri sticks so much but I’m sooo nervous! Thanks, Sharla! And thank you, DEARLY, for the nursery posts! I cannot thank you enough for the time and effort you put in to share your wealth of knowledge and strategies for teaching music. I regularly use your ideas and absolutely love your methods for teaching music. I can’t wait to purchase your book and dvd. Thank you! Hi! I am interested to know more about…. He Sent His Son: Fill in the Word Moving Squares! If you can teach me how you do this I would love it! Thank you!! Dear Kiersten, Some older children have to see words in order to cement them in their heads. Unfortunately, if they see them all in order with no effort, it just goes into the brain and right back out. To help the learning stay there, I mix it up a bit. I put the major words of the songs around the room, but with a twist… sometimes the words are divided into two parts. There is a poster up at the front of the room with those major words missing. I sing the song, and the children find the missing word, raise their hand, then I tap them on the shoulder to go get the word (or half of the word) and put it on the poster. Sharla, as I was looking through posts, I found this suggestion for Fill in the word moving squares. Is that a post you can guide me to. I could not find it! thanks. Sharla, Is there a song in the past you have done the fill in the word moving squares or something like this that you can lead me to please.